I drove to Frisco, TX, see my buddy Sam yesterday. Sam and his uncle worked on our sedan's a/c and Sam and I did some business: I got a complete bike, a reasonably nice frame and a frame with a bent fork and some usable parts. Here is the loot for your viewing pleasure! 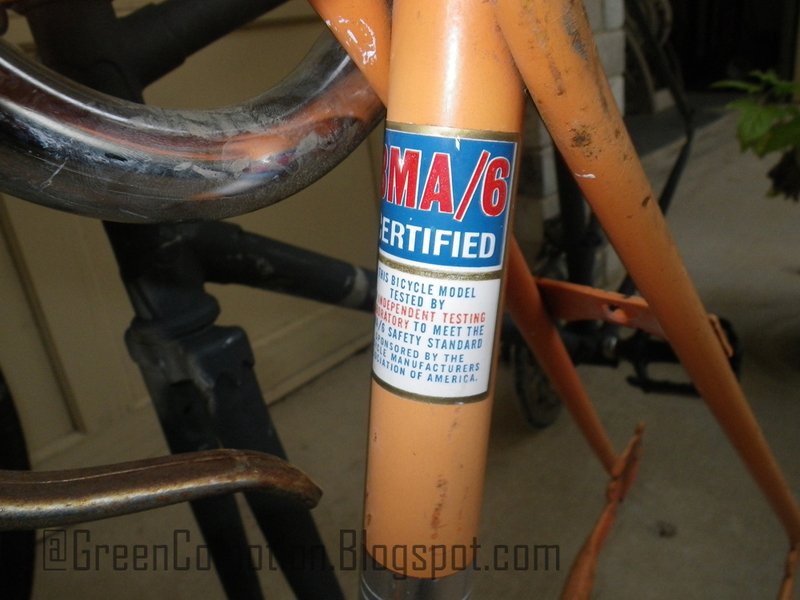 The frame I would like to use to build a new bike is the AMF Scorcher frame. I haven't done any research on the frame, yet, but it may be from the 70s. There are no dents or cracks on the frame. I suppose it could be used to build a pretty decent bike, for tooling around town. 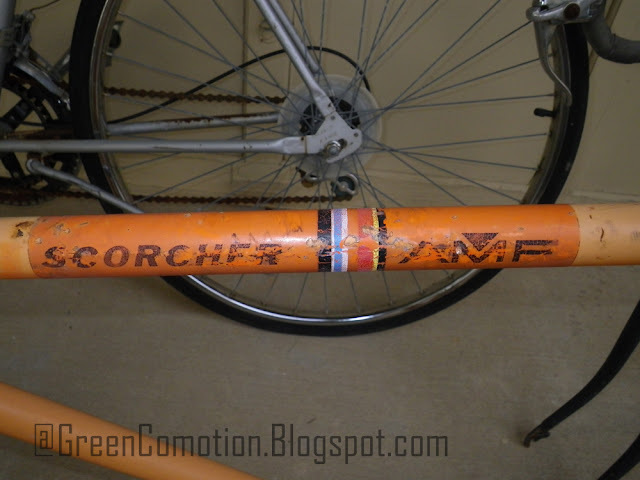 The original AMF Scorcher decals! The complete bike, the one leaning against the garage door is a Montgomery Ward species. I am not familiar with that make, but I figure it can at least be used for parts, or learning how to repair bikes. On this particular bike, the gears and brakes are all jammed up, possibly because of non-use. I do not know what brand or make the 3rd bike, the gray one, is. However, that doesn't matter as much to me as does the fact that it has a usable handlebar, crank, and a front derailleur. I may have to the wheels from the Ward's bike, in my new bike build, or get some used wheels. 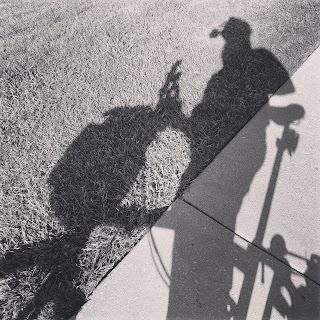 The wheels; on the Ward's bike are heavy; they feel like they are made of good ole' steel as well. 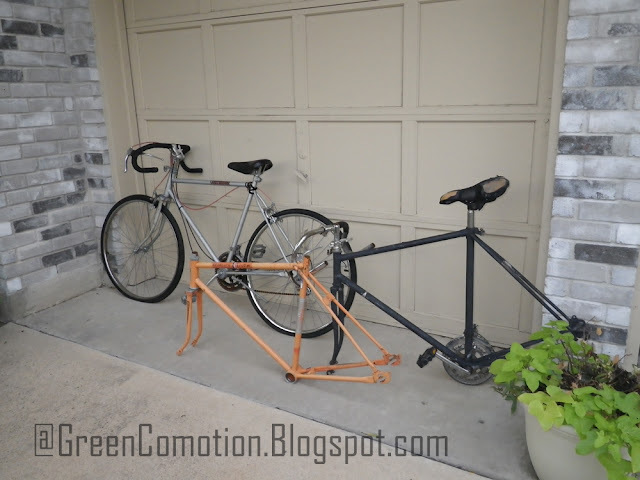 I would like to repaint the orange frame. Not sure of the color, when/how to do it, yet! Most interesting for me is that I have no clue how to any of these and I will have to learn a lot. I figure I ain't got much to lose, especially if I keep a close watch on my wallet. PS. I wonder if I can build a bike with a SA/Nexus IGH with Gates drive!